Discussion in 'Camp Cooking' started by jamesthomas, Oct 31, 2012. Yes the British have a very "odd" sense of humor in very dire times...., they are apt to do just that as bullets are bouncing off the sides of the tank, and if outside of the vehicle, an NCO who had his mug of tea hit by a stray German 8mm round could be easily imagined to remark, "OH that's just bloody rude!" During Gulf War I, a news crew did a report on a Foreign Legion unit. They hauled crystal and wine into the desert, and baked fresh bread every morning when possible. One stated, "We're willing to give up our lives, but not our life style." Not really a new thing for the French, It was Napoleon who said "an army marches on it's stomach. 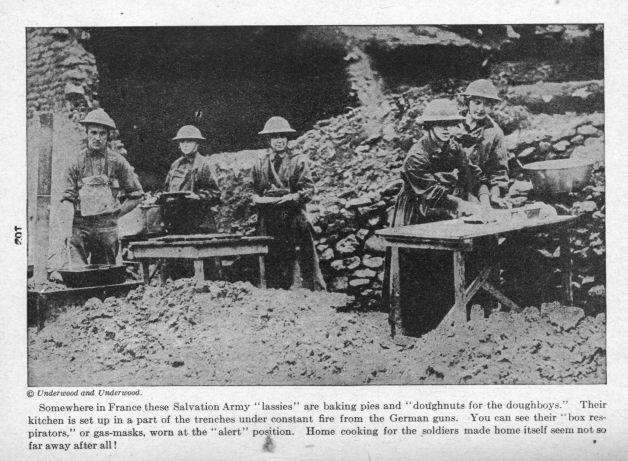 Here is a French photo from WWI of baking on the front lines. Making pies and doughnuts. That gave us canned food, but I doubt it was gourmand quality. Also, they still foraged as much as possible, because, yeah, troops need to eat. Didn't the British and Americans do that, too, at least for bread? My old man was in North Africa during WWII. He told me about one mess sergeant there who found a sheet of boiler plate and got a machinist to mill grooves into it, for the world's largest waffle iron. Little specialty treats makes up for a whole lot of bad conditions. Deep under the Indian Ocean with ‘filled milk’ and powdered eggs, the smell of oil and grease and the air vented from the sanitary tanks after we blew them dry, the cooks baked bread, and the boat smelled like home. I ve been on a trek or two that was wet and colder then comfortable but hot coffee in the can and a good pipe chased all the discomfort away. Folgers and Copenhagen. What a way to get a kick start in the morning! There are still times when I wish I hadn't quit the snoose. MaterielGeneral and Loyalist Dave like this. "It is doubtful whether any addition to the comfort of man within the last two hundred years in the realm of dietetics can be mentioned that equals them [coffee and tea]"
LD, sounds like you're retired?! It's very nice to watch the neighbors trot off to work! I am enjoying my retirement. Retirement is good. Work was beginning to interfere with my lifestyle. Over the weekend I made some ginger tea. slice some ginger length ways and put in a pot with some brown sugar. Melt the sugar and continue cooking on medium heat until the sugar darkens a deep dark brown and most if the moisture is removed from the ginger. Turn out on to parchment paper , separating the ginger slices and pouring some melted sugar over each one. When cool take a slice of now "candied" ginger and add to a cup of boiling water. The ginger infused sugar will dissolve making a nice "tea" tasting cup of ginger tea. You can also sprinkle the ginger pieces with some cinnamon before the sugar cools. If the ginger is still soft when cooled place in cooling oven over night to dehydrate. Loyalist Dave and Nyckname like this. I should've been retired five years ago, BUT with my youngsters apart by 6 years, the last one is still in college. So folks is it coffee or hot tea on cold winters morning? I'm a Earl Grey hot tea guy myself. I drink copious amounts of both every day. Several coffees in the AM then gallons of homebrew sweet (not too sweet) tea the remainder. I rarely almost never drink hot tea. One of the small pleasures in retirement is sipping coffee while catching up on this forum each morning. Its actually a rather large enjoyment and a big part of my morning ritual.Its my "waker-upper". Kansas Jake and Livbucks like this. Most coffee makers have a flip top, mine does. I like to pour a little coffee back into the filter containing the grounds.Kind of cycle it through again! I may be wrong but I feel it brings out some more of the "coffee ingredients" that are still remaining in the grounds. Why throw away the used grounds until you've gotten out the goodies that may still remain. Besides it does tend to make the coffee richer. Or so it seems anyway. My point exactly, you did buy that( the grounds I mean). So you may as well get the most out of them. Hey I'm the type how squeezes the last drop out of a tube of toothpaste. Or scrapes the insides of a peanut butter jar. I dont consider myself a "skinflint" but why not use it all , you paid for it. Besides who dont like rich tasting coffee? That high pitched noise you're hearing is Lincoln screaming from me pinching pennies. When I use my French press I make one vey strong quart of coffee and one that’s still rich second quart, pour them both in to one pot , or drink them from the press. When trekking I’ve made coffee in a quart pot and made two on the same grounds, three becomes weak and is more of a tea.